How we think about e-waste is in need of repair. The owner of the stall said that source of the chips was “PCs in internet cafes.” In China, at least, that’s a lot of potential PCs. In 2015, China had 146,000 internet cafes. 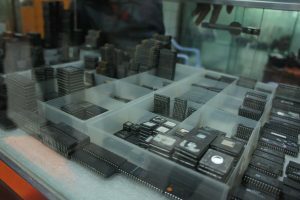 When those internet cafe PCs aren’t wanted, anymore, somebody goes through the trouble of breaking them down into parts for sale to a willing market which – in China – oftentimes means Huaqiangbei. It’s not just for hobbyists, either. For years, used Chinese parts have found their way into finished products that range from toys to U.S. Navy cargo planes. Making Everest Safe Makes it Unsafe. A couple of days ago I published a Bloomberg View column on ways to reduce deaths – and crowds – on Mount Everest. The two are closely related: too many people on the summit means that climbers are spending too much time in a dangerous, low oxygen environment. Why the crowds? Nepal’s government earns needed fees from climbers, and guides – primarily located out of Nepal – offer high-end, all-inclusive trips to the summit that oftentimes attract unfit climbers. Most of the talks I give touch on some aspect of my family background. But for plenty of reasons, I’ve skirted opportunities to go deeper (except in Junkyard Planet). But back in June, when I was invited to participate in TEDxBeijing, I decided to dig a little deeper. In part I did so because I’ve had people comment after my talks that I seem genuinely passionate about China’s scrap workers – yet I realized that I hadn’t left many clues about where that passion comes from. So that’s where this talk comes from, in appreciation for my brothers and sisters in all things scrap. I hope you enjoy it. Over the weekend the New York Times’ John Tierney published “The Reign of Recycling,” his attempt to show that recycling is more sentiment than it is good environmental stewardship, much less, good business. I’ll have much more to say about the meat of his work soon, but for now I’d like to make one small point about context, and how Tierney twists it. Now here’s the additional perspective that Tierney left out: in 2010, Americans consumed 42.6 billion plastic water bottles, alone, according to the Container Recycling Institute. That’s enough plastic water bottle waste to offset the greenhouse gases for 1,065,000 round-trips between London and New York in coach every year. If business or first class is desired, and you use Tierney’s methods, the numbers drop to 426,000 offsets. And it just gets better. Bottled water sales grew 7.4% in the U.S. last year. Not only that, Americans use many, many other types of recyclable plastic bottles – including detergent bottles, by the millions (or billions?). In other words – many more hundreds of thousands of greenhouse gas offsets between London and New York! Americans recycle enough plastic water bottles every year to offset the carbon emissions generated by the entire population of Anaheim, California flying round-trip between New York and London, annually. If we collect and recycle more bottles, that’s even more offsets (get to 400,000, and we’ve offset my hometown of Minneapolis). What could be better? Now, I have no idea why Tierney left out this key context from his piece. Maybe he didn’t think to look it up. Or maybe, as I suspect, he realized it undermined his argument. Whatever the case, I find it representative of “The Reign of Recycling” – sloppy, deceptive, and lacking any kind of context for a reader not familiar with the recycling industry. I’ll have more to say soon. The other day I was scanning headlines and came across an interesting item: earnings are suffering at Hershey’s chocolate due to a disappointing China performance. That’s not how it was supposed to work out: back in 2013 Hershey, in an expansionist mood, acquired candy maker Shanghai Golden Money for $584 million, in hopes that it could become China’s biggest chocolate player. What went wrong? Was this just another case of China’s souring economy dragging down another venerable American company? Or was there something else at play here – something more subtle. In search of an answer, I emailed a gentlemen whose judgment on foreign investments in China I trust, and who asked that – for the purposes of this blog – he be referred to as “Cocoa.” He took a look at Hershey’s attempt at an explanation, and used it to form his own. So, with Cocoa’s permission, I reprint Cocoa’s sound explanation for why Hershey’s is tanking in China. I have nothing to add to this except to say that, a) I agree, and b) it’s remarkable that after three decades, well-heeled, established companies continue to allow their enthusiasm to run past their common sense when seeking growth in China. Who Will Protest China’s Stock Market Plunge?